The US colony of Puerto Rico has suffered a series of shocks in recent years. In 2006, tax breaks intended to lure manufacturers to the island expired, prompting widespread capital flight. Then, the financial crisis hit, and the island’s government borrowed huge sums of money. The resulting debt crisis was followed by widespread public sector layoffs. Since then, the federal PROMESA law created an unelected financial oversight and management board, or Junta, which has moved to impose yet more austerity on the island. And that was before Hurricane Maria hit. More than three hundred schools have already been closed and huge numbers have left the island. Puerto Ricans are profoundly traumatized — which is precisely what successful shock doctrines depend on. That’s what Naomi Klein’s new book The Battle for Paradise: Puerto Rico Takes On the Disaster Capitalists is all about. Daniel Denvir recently spoke with Klein and Mercedes Martinez, the president of the Puerto Rican Teachers Federation, for the Dig, his podcast on Jacobin Radio. You can subscribe to Jacobin Radio here and listen to this episode here. What is happening in Puerto Rico right now in the wake of Hurricane Maria? Puerto Rico is still devastated after Hurricane Maria. Actually, Hurricane Maria just uncovered what’s been happening in Puerto Rico for decades, since we’ve been a US colony and a Spanish colony as well. We now have the fiscal board, which is imposing severe austerity measures against the working class, against our children. Yesterday was the last day of the semester and 265 schools are set to shut down permanently, affecting 55,000 students. Eighty-four percent of the schools set to be shut down are in rural areas of extreme poverty. We still have 60 percent of residents with no electricity. We have people still dying every day in our country, as a recent Harvard study exposed, because of government negligence over the energy problem that we have here. Law 80 is going to be abolished. It’s a law that can defend private working employees from unjustified layoffs, so they get just compensation. They are proposing to lower the minimum wage for our youth, twenty-five years and under. They are proposing to increase tuition fees at the University of Puerto Rico and shut down different campuses. So it’s disaster capitalism on steroids while we are living here in Puerto Rico right now. We’re talking a week after the Harvard study was published in the New England Journal of Medicine that estimated that the death toll in the aftermath of Hurricane Katrina. The “excess deaths,” as they call it, were around five thousand people as of the end of December. They noted that there was no sign that the numbers were going down. These “excess deaths” were happening before Maria as a result of public policy. If you look at that Harvard study, it’s clear that a natural disaster did not cause those deaths. The deaths because of high winds or falling debris were relatively small. The huge numbers of deaths were the result of infrastructure collapse. They were the result of lack of access to medical care, which is tied to the complete breakdown of the electricity system and the water system. This has everything to do with the fact that before Maria hit, Puerto Rico was experiencing a very high dose of what I’ve called the “Shock Doctrine,” of using a crisis — before Maria, it was an economic crisis, a debt crisis — to impose one of the most brutal austerity regimes in the world. We see such a high death toll because the systematic starving of the public sphere is why the infrastructure collapsed as spectacularly as it did. But now, rather than pulling back in any way, there is this intensification of that very program — a doubling down. Mercedes, can you explain the entity that’s imposing this austerity and these shocks on Puerto Rico — the financial oversight and management board that islanders call “La Junta.” What is it? How did it come about? Who sits on it? What is it trying to do? La Junta, or the oversight control fiscal board, is a dictatorship. It was appointed by the US Congress during Barack Obama’s presidency. Obama approved the law, called PROMESA. It was written to create ways to allow the Puerto Rican people to pay an odious debt of $72 billion. They created this fiscal board just as they did in Detroit. The fiscal board is supposed to implement severe austerity measures against the people of Puerto Rico, so we can repay a debt that has not been audited. We are requesting for the debt to be audited. The Junta, or the oversight fiscal board, is composed of seven members, unelected officials, who can overrule our laws and budget, who submit fiscal plans, who approve anything that happens in our country. So that is not democracy. That is a dictatorship of seven unelected officials who are governing our country. They are not here to put behind bars all the corrupt politicians or the bondholders, the people that put the Puerto Rican people into debt. It’s very curious to see that two of the members of the oversight fiscal board were involved in the bonds that were [issued] on behalf of Puerto Rican people when they worked at Santander Bank and the Banco Gubernamental de Fomento para Puerto Rico, which is the bank of the government of Puerto Rico. They are responsible for these bonds that were [issued] on behalf of our people. They are, as we say here, playing pitcher and catcher on both bases. They created the debt and we have to pay for it while they get benefits. Everybody knows the debt is not going to be paid back. The debt is unpayable. So Puerto Rico is being “structurally adjusted” through the use of debt. Some of the debt may be repaid, but what is happening now is the debt is being used as an economic weapon to force privatization and other profitable reforms. 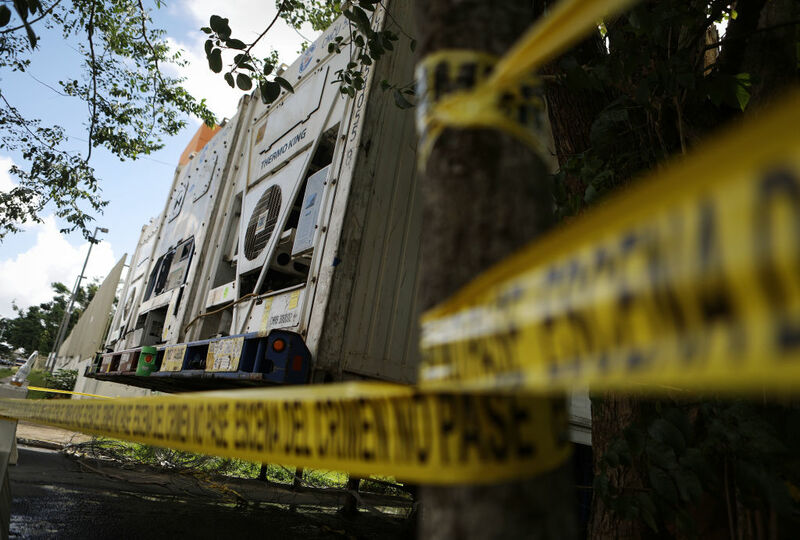 So it becomes the weapon that is used to demand the privatization of the electricity system — which itself carries a huge debt but is very profitable. So the profitable parts of the public utility will be auctioned off to private players while the debt will be offloaded onto the public. What Mercedes has been fighting is a similar process in the school system, cracking open the education system to charter schools. The Puerto Rico education secretary, Julia Keleher, said that New Orleans should be a “point of reference” for the island. She has been here for such a short time and created so much damage. She needs to get lost. She needs to leave our island immediately. She’s a business woman. She’s coming here as a puppet of the oversight fiscal board, to perform these atrocities against Puerto Rican children. She’s earning a quarter of a million dollars in salary, more than any [education] secretary in Puerto Rico’s history. Higgins, in the energy agency corporation, is making almost $500,000. The executive director of the fiscal board is making $625,000 a year. They have all approved their own personal version of Law 80, which is the law that they want to abolish, where you get just compensation if you get fired for not finishing your contract or for unjust layoffs. They created their own Law 80, so that even if they get laid off or even if their contract is expired, they get to collect all their money. They are damaging the children of Puerto Rico. Right now, as we speak, we have parents occupying the schools, making sure that no one takes anything from them, that no materials go out and nothing comes out, so they can save them. We are suing the government [over these closures] and expect the courts to rule in favor of us, on behalf of the children of Puerto Rico. Julia Keleher (who has a company called Keleher and Associates based in Philadelphia) came here four years ago and to make the conditions of privatization possible, to lay off thousands of teachers, to save hundreds of millions of dollars, without caring about the human necessities of the children of Puerto Rico and the teachers of Puerto Rico. We hear all this rhetoric of humanitarian aid and recovery going to Puerto Rico, but this is child abuse. You hear these figures about closing three hundred schools. It can seem abstract, but these are children who have lived through a profoundly traumatic event. Hurricane Maria was a massive trauma for everybody in Puerto Rico: we’re talking about children who lost their homes, who lost family members, who had this experience of it seeming that the natural world had turned against them. Everybody who has worked with children or is a parent knows that what children need in a situation like this more than anything is a return to some kind of normalcy, some kind of routine, to have a space of safety to process their experiences. That’s what school can and should be in a moment like this. So this is a process of just incredibly heartless re-traumatization of children and families in Puerto Rico. A week after the hurricane, teachers themselves reopened the schools. They reconditioned the schools, machete and chainsaws in hand, and put the roofs back on the schools. And we sent Keleher a letter saying, open at least the lunch room, because children have no electricity. Children have no water in the houses. You have gas stoves and you have food there that you can feed the entire community. Open them up and we will cook. She denied that, so a lot of parents occupied even the lunchrooms after the hurricane, to be able to feed the children and all the community members. Then, as two weeks passed, the schools were ready to reopen in the majority of the cases, thanks to the work of the people. Because only the people will save the people. The government did not appear — not federal, not state. The pretext for why these school closures are happening is that there aren’t enough students to justify it, right? But if you look at the numbers, the student-teacher ratio in these schools is actually where it should be. The student-teacher ratio was way out of whack before because the schools were so underfunded, but this “crisis” that they were trying to fix is actually a healthy student-teacher ratio. Which apparently the students of Puerto Rico don’t deserve. Governor Ricardo Rossello said that Maria had turned the island into a “blank canvas.” Naomi, you write that it’s a vision of “Puertopia,” using huge tax breaks to lure rich transplants, including “cryptocurrency bros,” to the island. There’s a 4 percent corporate tax rate, dividends from island-based companies to island-based individuals are tax free. No federal income tax. To benefit from these tax subsidies these rich transplants just have to spend 183 days of the year on the island, which, as you point out, Naomi, is perfect for rich people who’d like to spend their winters somewhere warm. Talk about this development scheme that the Puerto Rican government and business elites are pushing, including this bizarre crypto invasion. It really is just a scheme. It’s about trying to have some kind of economic activity on the books. The irony is that this most recent economic crisis in Puerto Rico was catalyzed by the expiration of tax breaks that used to be offered to American companies to encourage them to build factories in Puerto Rico and create very large numbers of jobs. Puerto Rico really was the laboratory for the export-processing zone, free-trade model that swept the world, because Puerto Rico is an American territory. In the ’40s, ’50s, and ’60s, an economic project called Operation Bootstrap, gave American companies these tax breaks so that they would go to Puerto Rico and build factories. They were low-wage factories that eventually moved to Mexico and Central America and then Asia. You didn’t need free trade deals to do this in Puerto Rico because Puerto Rico is a US territory. It still was technically “made in America.” But what really started to devastate Puerto Rico’s economy was when NAFTA was signed and markets with even lower wages and weaker regulations on offer. Those tax breaks were allowed to expire because they were no longer needed. So the whole model was replaced by the free trade model. The end date for the expiration was 2006. That was the economic shock that catalyzed the debt crisis. At least those tax breaks required that these companies create jobs and build real factories. Now what they have are these laws that allow American companies to change their addresses to Puerto Rico, but we’re talking here about financial companies, tech companies, and increasingly, cryptocurrency-related companies. They’re not building factories and employing huge numbers of Puerto Ricans. There used to be a requirement that they create four jobs, and just a year ago they got rid of even that requirement. You don’t even have to hire a Puerto Rican gardener if you don’t want to, to benefit from this buffet of tax giveaways. No capital gains tax, no tax on interest — so if you are a crypto trader and you want to cash out, you want to sell your bitcoin and turn it into hard US currency, then what you’re most afraid of is getting taxed on that, right? So what Puerto Rico is offering to those crypto bros is, “Come here, do your trading and you won’t get taxed at all.” The corporate tax rate, as you mentioned, is 4 percent. You think about that in the context of Trump’s tax cut, which lowered the corporate tax rate in the US mainland to 20 percent, which was already a significant cut. And this is what Puerto Rico is offering, so you can imagine why it is such an appealing offer. Like I said, it’s a scheme, because there’s just so little job creation connected to it. One key aspect of this dystopian model for the island’s future is depopulation, which has been taking place for many, many years but has rapidly accelerated in Maria’s wake. It’s a process that, if not intentional, is at least pretty welcome to those pushing to implement this Puertopia vision on the island. What has the flight of people from the island looked like? Hundreds of thousands of people have already left the island. One study showed that 6 percent of the people that left aren’t coming back to our country. It’s obvious that they want to depopulate our country. If you close a school in a rural area where it’s the only school, and the closest school is fourteen kilometers away and people have no cars, you are making them leave the mountains and you are making them leave our country, and you have no jobs. Last year, more than 45,000 jobs in the private sector were lost in our country. Right now they are imposing “incentivized retirement.” They pay you for a year, but then for five years you can’t work on any government agency. The private sector is not offering any jobs — where are the people going to go after the year? They’re pushing people out of our country to allow the rich to come here and create their own towns, their own cities, their own Puerto Rico. They’re coming here trying to buy the land and have their own private hospitals, their private schools, their private land, their private anything. Before the hurricane hit, Puerto Rico was in a high state of social movement mobilization. Last spring, there was this massive strike at Universidad de Puerto Rico protesting proposed tuition hikes and budget cuts. There were massive May Day protests. Mercedes, tell me about these mobilizations that were underway, what happened when Maria hit, and moving forward, what movements are going to do given the enormous power of your enemies. Prior to the hurricane, there were huge mobilizations. Students of the University of Puerto Rico had a strike for seventy-two days and they won one of their claims against the tuition fee increase. On May 1 last year, around 80,000 people flooded the streets of San Juan, particularly on what is called the Gold Mile, which is where the bankers are, protesting against these severe austerity measures, and were able to stop a lot of them. The Governor of Puerto Rico amended the penal code in Puerto Rico to implement many more years of incarceration for people that protest if they commit a crime — people that block the streets, people that block the entrance of the schools for the occupations. So they are trying to make people feel scared to protest. This May 1 was amazing as well. The banks were shut down. The biggest mall in Puerto Rico was shut down. Police brutality has been implemented against all of those who struggle. We saw this on May 1, where tear gas, rubber bullets, 1,100 cops were sent to demonstrations of the working class, of university students, environmentalist groups, feminists. They are trying to implement terror, but people are fighting back. We have been arrested for doing civil disobedience to ask the government to open the schools. But we are not scared. They think that they are going to drive us away or scare us through these terrorizing policies and police brutality against the people of Puerto Rico. They are wrong. We have nothing else to lose. And creating space to dream, which was pointed out to me when I was in Puerto Rico, is exactly what colonization was designed to extinguish. The right of people to dream their own future and design their own destiny. The fact that the Puerto Ricans are doing this under such extraordinary circumstances, I think, is something we all have to learn from.